DALLAS - Frank Larison is a disabled veteran with more than 14 years of service, including more than a year of combat duty in Vietnam. 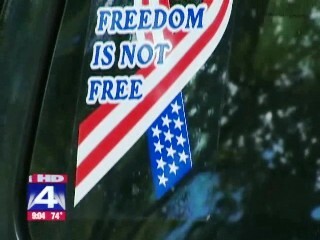 "To me, it's being patriotic, and it shows that I served," the veteran told FOX 4. The Woodlands II on The Creek --- where Larimore has lived for eight years --- says in a letter it will tow the car at Larimore's expense. The board also threatens to fine him $50 for any future incident. Larimore says the decals, ranging from the Marine emblem to Semper Fi slogans, aren't advertisements for anything. "You can't buy freedom," he reasoned. "That is his identity," said neighbor Mary Castagna. "He goes to a lot of the veteran meetings, and it means a lot to him. Everyone else agrees with it; it doesn't bother anybody." 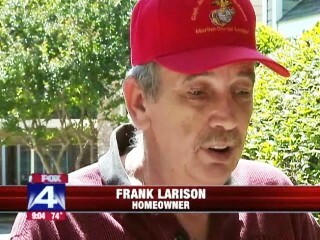 "He's in the Marines, and he's proud of it, and I don't blame him," said neighbor Paul Hardy. "If I'd gone through what he's gone through, I'd be kind of proud of it myself." The letter from the board states you can't have any form of advertisement anywhere on your car on your property. FOX 4 cameras spotted bumper stickers for political parties, health causes, and other non-commercial interests on the property as well. One board member said he was unaware the HOA presidents sent the letter and did not know of any issue with Larimore's vehicle. "I will be looking into it," said board member Art Bradford. "I didn't know anything about this. I haven't seen this." The board president was out of town and unavailable. The condo management company did not want to comment.